1. What are Live Ratings? 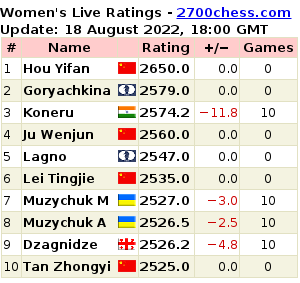 Live ratings are daily updates of the chess ratings of top players. Usually such ratings are updated within 1 minute of a game finishing, if it is played in a top tournament. Live Ratings are based on official ratings (FIDE ratings) which are updated once a month. 2. Why is the website called "2700chess"? "2700" is considered the benchmark for the world’s elite chess players. 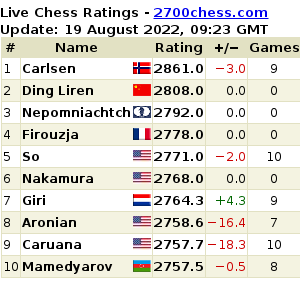 You can see the highest FIDE ratings of every 2700+ player at http://test.2700chess.com/records Also you can see the Top-20 players were in any month starting from June 1967 as well as the greatest historical players and their virtual ratings as calculated by Professor Arpad Elo. We are pleased to inform you that we combined all the official ratings for top players from 1971 to the present day. We’ve also included earlier unofficial ratings that commenced in 1967. You can also see data for any player when s/he was in top-100 at any time since 1967. Every chart point has info that can be seen by placing your cursor on it. You can compare players' charts using different filters. 5. How can I find my favorite players' games? You can find not only your favorite players' games, but probably your own games too! Just go to our database at 2700chess.com/games and start typing any players' name and Select the name you’re looking for from the auto-complete hints and press Search (or Enter). Also you can select a famous player from drop-down menu at the right side of the White or Black Player Name. Another possible option is to do a quick search for the games from the main page. 6. What features are available when I’m reviewing a game? You can see the player’s actual Age when the game was played. The player’s national flag shows the federation he last represented (if s/he inactive or dead) or is currently representing, which may not be the flag s/he played under during the game. O download or print the game. Last but not least, the url for the game is unique. For instance 2700chess.com/game/capablanca-alekhine-r1-buenos-aires-1927-09-16 can tell you quickly who played where and when. 7. Daily Email Notifications about your favorite players (Live Rating, World Rank, Games). To keep up with current events, you can receive daily e-mails that advise you of changes in live ratings, world rankings and games links (if available) for your favorite players. These e-mails will provide the information you need about games played in all three main formats: classic, rapid and blitz. To make this happen, go to Settings/Email Notifications and add your favored player/s from the drop down menu. You will receive regular e-mails updating information about these players, which will be like reading your favorite daily newspaper! This feature is available for Premium Members. You can play a game against our computer at 2700chess.com/play-computer using different levels whose strengths range from 1400 elo to 2800 elo. Also you can play a training game from any position of your favorite game in our chess database. But please note, we recommend using a desktop computer when playing vs Computer since it usually takes less time to process a position, especially at the higher levels. 9. What I can store in My Library? After you’ve registered, you will have your own library on 2700chess where you can store your favorite games, favorite players, played games vs Computer, your analysis and uploaded games. However, to have unlimited access to your library you need to be a premium member. 10. I can sort columns by Rapid or Blitz ratings or click the Rapid or Blitz tabs. Does doing so lead to the same result? No. If you click on a column (on the row below the tabs), it sorts players’ names that are already within the tab which is activated (Classic, Rapid or Blitz). For example, the default position when you open the site is with the Classic tab open. If the rapid column is clicked with the Classic tab open, it will show the rapid rating of the top classic players already displayed. But if you click on the Rapid or Blitz tab, then it will show you the best Rapid or Blitz players, regardless of their classical rating. If you then click the Top100 Tab, it will show the top100 in Rapid or Blitz. You can also sort players (in every format Classic, Rapid or Blitz) by Name, Country, ranking s/he has moved up or down, net rating points lost or gained, or by Age. 11. How can I find out exactly which players have been most recently updated? 4) look at the games displayed in Chess Theatre. 12. I believe that a particular player has 2700+ in rapid, but I can't see his name on the list of best Rapid players generated by clicking on the Rapid tab. Why is that? It may happen because the player's rapid rating is inactive, which means he did not play any rapid games during the last year. 13. I can't find my favorite player. Why? Firstly, type his or her name in the Search field. It will search amongst the list of Top100 players (or amongst the Top50 Women’s players section). If this does not help, you can try to find him/her in the "All Fide Players" menu. Probably, the player is playing/played a chess tournament and his or her rating dropped out of Top100. If you are still sure your favorite player must be amongst the Top100/Women’s Top 50 then please email us. 14. Can you tell me about Chess Leagues? Chess Leagues are team events inside a country. Sometimes they are played over many months with one round per month, and take place on a weekend, but sometimes it is played every day like a usual chess tournament. A player is not obligated to participate in the entire tournament, unlike typical non-team tournaments. 15. What do the "i" and "unrat." symbols mean? "i" symbol means an inactive rating. Please note players with inactive ratings (who did not play a single for the last year) are not sorted in ranking lists. "unrat." means player does not have a rapid (blitz)rating yet, inactive or active. 16. What formula does FIDE use for calculating rapid and blitz ratings? It's the same formula used for calculating standard ratings, but with K=20. 17. What is formula for calculating Live Ratings? 18. The game started but player 2 did not make a move. Is the game rated? Whether unplayed games occur because of forfeiture or any other reason, they are not counted. Any game where both players have made at least one move will be rated. The result of the game is recorded as +:- or -:+. 19. I saw the result recorded as 0:0. How is this possible? The game was played but both players violated tournament policy. One example is where both players agreed to a draw prior to an official minimum move count for draw agreement. Instead of the game being recorded as 1/2:1/2, the result of the game is invalid, and thus 0:0 is recorded for tournament and for rating purposes. 20. I saw the result recorded as 1/2:0. How is this possible? It means that player A has a lone King (insufficient material to checkmate) and player B has enough material to checkmate player A. However, player B's cell phone made a sound and s/he therefore forfeits the game. The game is recorded as 1/2:0 for rating purposes. 21. I also have a FIDE rating, but can't see myself in the list of “All FIDE Players”. Why? Probably you have not played recently and your rating became inactive. Please choose “Both” in the “Activity” field and press Enter. 22. I have an idea how to make 2700chess better. 23. Why is/are the name(s) of one or more players in bold in the Finished Events list? Bolding a player's name means they won or shared first place in the event or were a member of a winning team.